I've been using this a lot. I started using this when my skin was constantly breaking out. It doesn't irritate my skin and fixed my breakouts in a few days. When I use other emulsion or milk, I usually get breakouts but this is ok. It's also worth its price so I'll keep on using this! I have acne prone skin and didn't use emulsions a lot, but I thought maybe my acne was from dry skin so I bought this since it was for sensitive skin and the price was ok. After toner, moisturizer, acne medication, I take 1 push of the product for final moisture. At first it feels a little bit sticky but after a while, it doesn't bother me at all. I used this for about 2 weeks and my acne didn't get any worse and was really moisturizing. (I don't have dry skin) but my skin stays moisturized until the next morning. I would like to see what it will be like if I were to continue a little more and whether it is necessary in the future. I can't live without this product. My skin gets oily and dry, and when I moisturize too much it gets super oily and I get breakouts, and when I don't moisturize enough my cheeks would feel so dry... Such skin had been troubling me for years, but ever since I found this item, I feel so happy. Seriously! It's not as rich as a cream, nor is it as light as a gel. It gives fantastic hydration to my skin, and my skin condition is superb when I wake up in the morning. Before, I couldn't wait to wash my sticky face in the morning. At night, I apply full 1 pump. In the morning before applying makeup, I use a little less than that. I can also mix it with a little drying primer or cream foundation. It's easy to mix since it's an emollient milk. I don't think I'll go for any other products anymore. When I have time, I do a cotton mask with Hatomugi Lotion (ethanol-free) or apply a sheet mask, and finish with this item. When I don't feel like it, I only apply this directly onto my face after a bath! I use this item just as it says to, and I no longer get many breakouts. I cannot thank Minon enough. 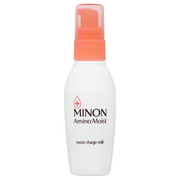 Minon makes nice products for sensitive skin, and this was highly reviewed, so I bought it. My moisturizer didn't hydrate my skin enough. This product comes in a pump bottle, and is so easy to use. The texture is more of a cream than an emollient milk. You have to be careful because when you push the pump completely down, it pumps out too much product. One pump was too much product for me. So I just push and stop halfway down. It goes on well with a small amount, and is easy to apply. I think it is quite moisturizing. I didn't have any skin problems, so I can use this without worrying. 1con is that it feels a little sticky after usage. I have to blot it with a tissue on my forehead where my bangs would touch. (I don't like my bangs getting sticky.) I'll buy it again this unless I find something more attractive to me.